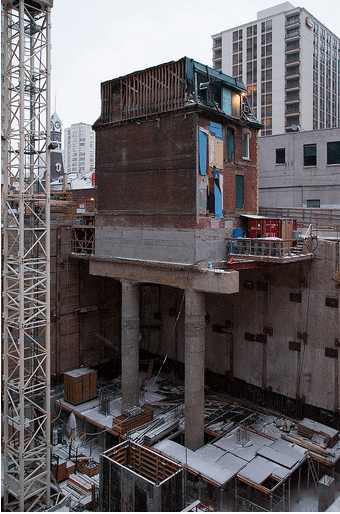 Historic building defies gravity on concrete stilts while construction goes on below it. WHAT: The John Irwin House, dating back to 1873, which had to be moved to the north-east corner of the site in order to accommodate the new 50-storey Karma condo development. The house is resting on a new foundation and support columns, and will remain perched on its concrete legs until construction on the condo’s underground parking lot is complete. When the condo complex opens, the historic building will be reinvented as retail or restaurant space.